Dean Willie Reed congratulates Outstanding Staff Award recipient Dennis Barnett. 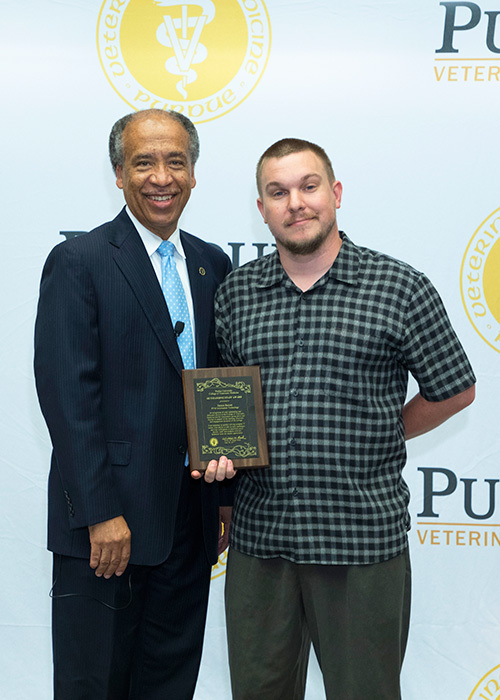 Purdue Veterinary Medicine's Outstanding Staff Awards Ceremony for 2017 featured awards and recognition for a total of 20 staff members. Held in Lynn 1136 Wednesday, June 28, the program began with the presentation of the Outstanding Staff Award, which has been given since 1988, when the award was initiated with a gift from the late PVM alumnus Carl Osborne (PU DVM '64) and his wife Lynn. The Outstanding Staff Award recognizes excellent performance by the College of Veterinary Medicine's non–faculty, full–time employees. This year, two Outstanding Staff Awards were presented by Dean Willie Reed. The first was given to Dennis Barnett, systems engineer in the Department of Veterinary Administration. Dean Reed praised Dennis for providing outstanding customer service and meeting the IT needs of PVM faculty and staff members. Dean Reed also read letters of support that commended Dennis for having "...the rare ability to translate technical information and communicate it in a way that less–technically proficient faculty and staff can understand..." Dennis also was recognized for his problem solving skills, his willingness to volunteer, and his dedication to getting the job done with a good attitude and a smile. Dean Reed then presented the next Outstanding Staff Award to Dr. Kauline Cipriani, director of the PVM Office for Diversity and Inclusion, congratulating her and thanking her for all she has done for the College and the profession. 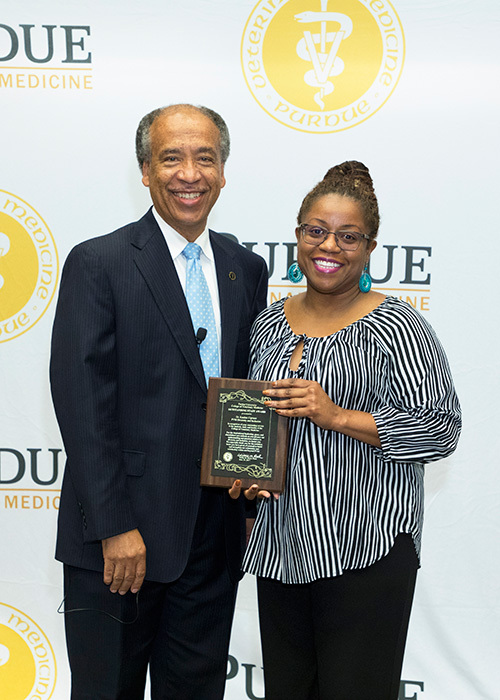 "You not only have accomplished much through your work with our faculty, staff and students, and through establishing successful new programs... you also have made a measurable impact on diversity and inclusion within our College and nationally in the veterinary medical profession," Dean Reed said. He also read from letters of support, which praised Dr. Cipriani for being welcoming; for truly caring about making Purdue a diverse place for students, faculty and staff; and for being "...passionate about developing and delivering diversity and inclusion programs which support faculty, staff and students." Outstanding Staff Award recipient Kauline Cipriani with Dean Willie Reed. Dean Willie Reed congratulates Donna Griffey on receiving the Outstanding Research Staff Award. 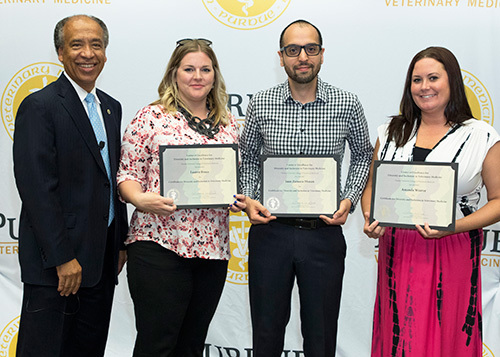 Dean Willie Reed congratulates staff members who completed the Online Certificate Program for Diversity and Inclusion in Veterinary Medicine (left–right): Lauren Bruce, Juan Zamora–Moran and Amanda Weaver. 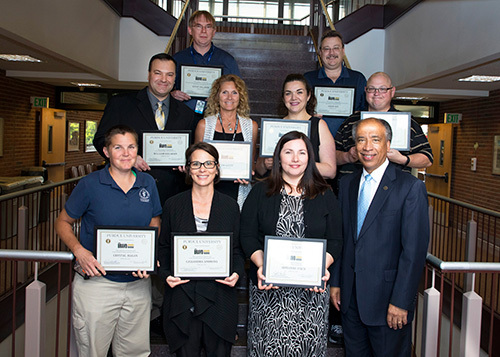 Dean Willie Reed with PVM Bravo Award recipients: (front row, left–right) Crystal Hagan, Cassandra Simmons and Adrianne Fisch; (middle row) Bill Kielhorn, Jan Goetz, Marisol Uribe and Nicholas O'Neill; (back row) Steve Vollmer and Jason Lee. 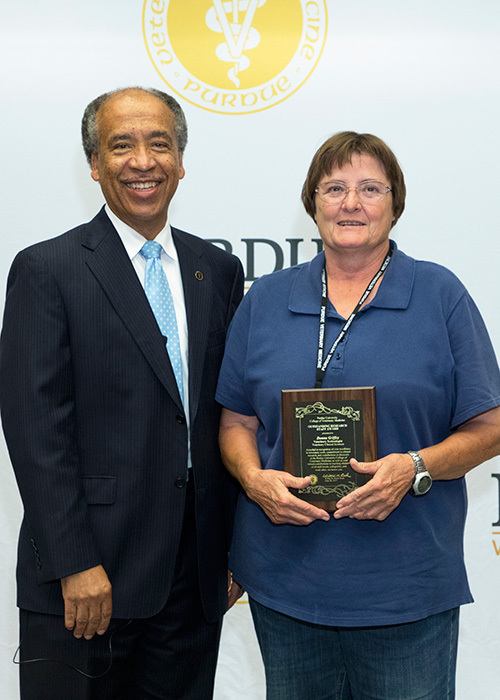 Next, Dean Reed presented the 2017 PVM Outstanding Research Staff Award to Donna Griffey, RVT, veterinary research technologist in the Department of Veterinary Clinical Sciences. The award is for a non–faculty research staff–member. Donna was recognized for making outstanding contributions to Purdue Veterinary Medicine equine research while also using her expertise and abilities to provide excellent support for the College's teaching and service missions through her work in the Department of Veterinary Clinical Sciences and the Large Animal Hospital. In particular, she was commended for contributing to the success of a large number of research projects, especially equine studies in which she conducted treadmill tests on 475 horses and helped perform more than 1,000 lung function tests since PVM's Equine Sports Medicine Center opened in 1996. The awards ceremony continued with the presentation of certificates to staff members who completed the Online Certificate Program for Diversity and Inclusion in Veterinary Medicine. The program was developed in conjunction with the American Veterinary Medical Association and the Association of American Veterinary Medical Colleges through PVM's Center of Excellence for Diversity and Inclusion. "Diversity and inclusion are key components of our College's values and culture," Dean Reed said. "We are proud of these individuals for their dedication in promoting a collegial work and learning environment enhanced by diversity." To successfully finish the online certificate program, the participants completed a series of online modules; gained life experiences through volunteer community service and activities such as attending cultural events and lectures in the community or national or regional meetings focused on diversity and inclusion; and reflected on their experiences. They also submitted a capstone paper on how they will use the information gained in this program to strengthen diversity and inclusion in veterinary medicine. Congratulations to the following staff–members who received the certificates of completion: Lauren Bruce, VTH / ADDL marketing and communications manager, Department of Veterinary Administration; Kathleen Burke, teaching technologist, Department of Comparative Pathobiology; Juan Zamora–Moran, secretary for the Office of International Programs, Department of Veterinary Administration; and Amanda Weaver, health information technician in the Veterinary Teaching Hospital. Steve Vollmer — for innovation and creativity, operational excellence and fiscal stewardship in his role as computer systems manager in the Animal Disease Diagnostic Laboratory. Congratulations to all of the award recipients! Photos of the award recipients were taken by professional photographer Ed Lausch.